I would like to apply a Quartz filter to reduce file size when printing as a PDF file. Now I have to print the file to my Desktop as a PDF, then open it, and apply the quartz filter and save the file again. Then email it. It would be great to just automate the whole thing from the original PDF dialogue box. Should a picture be worth less than a thousand words to you, here are the steps: Launch Automator and, in the template chooser that appears, select Print Plugin and click Choose. 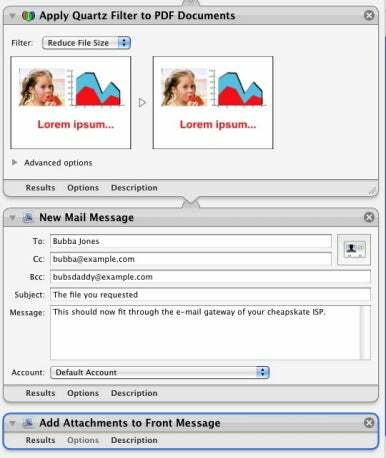 In the resulting workflow add these actions: Apply Quartz Filter to PDF Documents (found under the PDF heading), New Mail Message, and Add Attachments to Front Message (both found under the Mail heading). In the Apply Quartz Filter to PDF Documents action choose Reduce File Size from the Filter pop-up menu. In the New Mail Message feel free to fill in any of the empty fields—To, Cc, Bcc, Subject, and Message—as well as choose the account you’d like to send these messages from. Save your workflow and give it an intuitive names such as Smush and Send. When you next want to do this kind of thing, open your PDF file in Preview, choose File -> Print, and from the PDF menu in the Print dialog box choose your Smush and Send workflow. As promised, that workflow will reduce the file’s size, create a new mail message, and attach your slimmer PDF file to it. If you wanted to skip the whole printing rigmarole, you could simply create an Application workflow that contained these steps: Copy Finder Items, Apply Quartz Filter to PDF Documents, New Mail Message, and Add Attachments to Front Message. Save it to the Desktop and when you want to smush and send a PDF file just drop it on top of this application.